فلزات سنگین یکی از مهم‌ترین آلودگی‌های محیط زیست به‌شمار می‌آیند. افزایش غلظت این فلزات در آب، بیش از حد تعیین شده در مقررات زیست محیطی، می‌تواند اثرات جبران ناپذیری برای سلامتی انسان داشته باشد. هدف از این پژوهش حذف یا کاهش فلزات سنگین از قبیل سرب، روی و کادمیم توسط نانو لوله‌های کربنی اصلاح شده با کیتوزان از محیط‌های آبی است. در این پژوهش نانو لوله کربنی چند جداره اصلاح شده با کیتوزان به‌عنوان جاذب اسـتفاده شـد. برای تکمیل آزمایش از محلول نمک نیترات فلزات سنگین تهیه شده با آب مقطر به‌عنوان محلول استفاده شد. متغیرهـای مـورد مطالعـه در این پژوهش عبارت بودند از pH محلول، زمان ماند، غلظت اولیه فلزات سنگین و مقدار جرم جاذب. کلیه تجزیه و تحلیل‌های آزمایشگا‌هی بر اساس استاندارد متد انجام شد. برای شناسایی و تعیین اصلاح ساختار جاذب اصلاح شده از طیف سنجی مادون قرمز و میکروسکوپ الکترونی روبشی استفاده شد. نتایج پژوهش نشان داد که راندمان جـاذب در جـذب آلاینـده بـا افزایش زمـان مانـد، غلظـت فلزات سنگین و pH افزایش می‌یابد. بهترین عملکرد جاذب با راندمان بیش از 75 درصد در شرایطی به‌دست آمد که pH برابر 7، زمان 120 دقیقه و غلظت اولیه فلزات سنگین برابر با 20 میلی‌گرم در لیتر بود. با رسم نمودار ایزوترم‌های جذب لانگمیر و فروندلیچ مشخص شد که فرایند جذب از ایزوترم جذب فروندلیچ تبعیت می‌کند. با نتایج به‌دست آمده در این پژوهش می‌توان نتیجه گرفت که استفاده از نانو لوله‌های کربنی اصلاح شده با کیتوزان، راه حل مناسبی به‌عنوان جاذب مؤثر در حذف فلزات سنگین از قبیل سرب، روی و کادمیم از محیط‌های آبی می‌با‌شد. Discharge of toxic metals such as cadmium (Cu), lead (Pb), and zinc (Zn) in the environment can impact the quality of air and water. High concentration of these toxic metals larger than the regulated concentration in the air and water can pose serious human health risks. The aim of this research was to investigate the removal of these heavy metals (Cd, Pb and Zn) from aqueous solutions by using a multi walled carbon nanotubes modified by chitosan as an absorbent agent. To perform the experimental study, nitrate salt of heavy metals solution prepared with distilled water was used. Factors examined for the removal efficiency of heavy metals in this study include pH, absorbent dose concentration, retention time, and the initial concentration of heavy metals. All analytical analyses were performed according to standard methods. Also, the infrared spectroscopy (FT-IR) and scanning electron microscopy (SEM) used for identification and modification of the absorbent. The results obtained from this study showed that an increase in pH, retention time and initial concentration of heavy metals, also increased the adsorption efficiency rate. The optimum heavy metals removal efficiency was about 75% and that occurred when pH =7, retention time =120 minutes and the initial concentration of heavy metals =20 mg/L. In addition, plot of Langmuir and Freundlich adsorption isotherms for heavy metals showed that the adsorption process mostly follows the Freundlich isotherm. The limited data obtained from this experimental sudy, it can be concluded that using carbon nanotubes modified with chitosan as an absorbant agent is an effective method for the removal of heavy metals (Cd, Pb, and Zn) from aqueous solutions. Boparai, H.K., Joseph, M. & O’Carroll, D.M., 2010. "Kinetics and thermodynamics of cadmium ion removal by adsorption onto nanozerovalent iron particles", Journal of Hazardous Materials, 186 (1), 458-465. Bailey, S.E., Olin, T.J., Bricka, R.M. & Adrian, D.D., 1999, "A review of potentially low-cost sorbents, Water Research, 33(11), 2469-2479. Ekinci, E., Budinova, T., Yardim, F., Petrov, N., Razvigorova, M. & Minkova, V., 2002, "Removal of mercury ion from aqueous solutions by activated carbons obtained from biomass and coals", Fuel Processing Technology, 77- 78(1), 437-443. Gibicar, D., Horvat, M., Logar, M., Fajon, V., Falnoga, I. & Ferrara, R., 2009, "Human exposure to mercury in the vicinity of chlor-alkali plant", Environment Research, 109(1), 355-367. Girginova, P.I., Daniel-da-silvia, A.L., Lopes, C.B., Figueira, P., Otero, M., Amaral, V.S., et al., 2010. "Silica coated magnetite particles for magnetic, removal of from water", Journal of Colliod and Interface Science, 345(2), 234-240. Herrero, R., Lodeiro, P., Castro, C.R., Vilarin, T. & Vicente, M.E.S.D., 2005, "Removal of organic mercury from aqueous solutions biomass of the marine Macroalga Cystoseirabaccata", Water Research, 39(14), 3199-3210. Kosa, S.A., Al-Zahrani, G. & Abdel Salam, M., 2010, "Removal of heavy metals from aqueous solutions by multi-walled carbon nanotubes modified with 8-hydroxyquionline", Chemical Engineering Journal, 181-182(0), 159-168. Li, P., Feng, X.B., Qiu, G.L., Shang, L.H. & Li, ZG., 2009, "Heavy metal pollution in Asia: A review of the contaminated sites", Journal of Hazardous Materials, 168(2-3), 591-601. Lu, C. & Chiu, H., 2006. "Adsorption of zinc (II) from water with purified carbon nanotubes", Chemical Engineering Journal, 61(4), 1138-1145. Ren, X., Chen, C., Nagatsu, M. & Wang, X., 2010. "Carbon nanotubes as adsorbents in environmental pollution management: A review", Chemical Engineering Journal, 170(2-3), 395-410. Shamspur, T. & Mostafavi, A., 2009, "Application of modified multiwalled carbon nanotubes as a sorbent for simultaneous separation and preconcentration trace amounts of Au (III) and Mn (II)", Journal of Hazardous Materials, 168(2009), 1548-1553. Stephen Inbaraj, B. & Sulochana, N., 2006, "Lead adsorbtionon a carbon sorbent derived from fruit shell of terminaliacatappa", Journal of Hazardous Material, 133(13), 283-290. Tofighy, M.A. & Mohammadi, T., 2011, "Permanenthard water softening using carbon nanotube", Sheets Desalination, 268(1-3), 208-213. Vukovic, G.D., Marinkovic, A.D., Colic, M., Ristic, M.D, Alesksic, R., Peric-Grujic, A.A., et al., 2010, "Removal of cadmium from aqueous solutions by oxidized and ethylenediamine functionalized multi-walled carbon nanotubes", Chemical Engineering Journal, 157(2010), 238- 248. Yan-hui, L., Ze-chao, D. & Zhao-kun, L., 2004, "Removal of heavy metal from aqueous solutions by carbon nanotubes: Adsorption equilibrium and kinetic", Journal of Environmental Sciences, 16(2), 208-211. Yardim, F., Budinova, T., Ekinci, E., Petrov, N., Razvigorova, M. & Minkova, V., 2003, "Removal of mercury (II) from aqueous solutions by activated carbons obtained from furfural", Chemosphere, 52(5), 835-841. 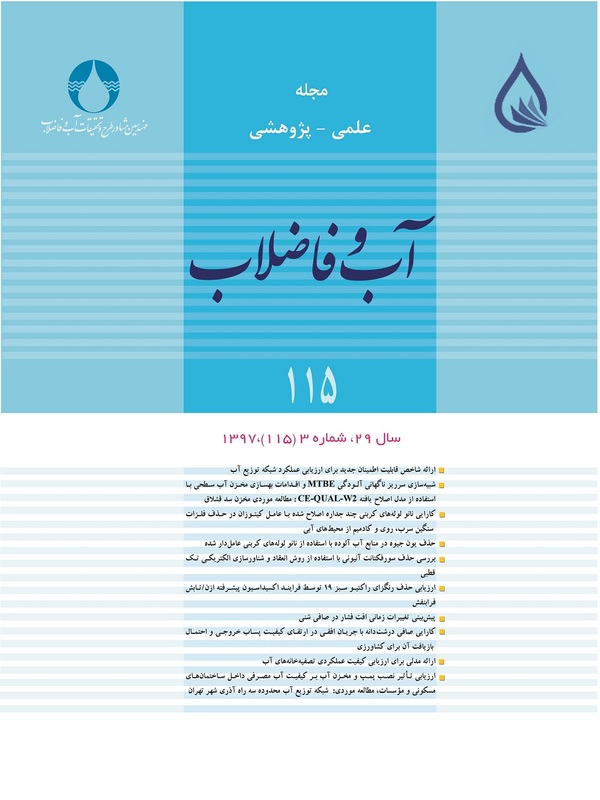 Zazouli, M.A., Yousefi, Z., Taghavi, M., Akbari, B. & Yazdani, J., 2013, "Cadmium removal from aqueous solutions using L-Cysteine functionalized single-walled carbon nanotubes", Journal of Mazandaran University of Medical Sciences, 23(98), 37-47. (In Persian). Zhu, J., Deng, B., Yang, J. & Gang, D., 2009, "Modifying activated carbon with hybrid ligands for enhancing aqueous mercury removal", Carbon, 47(8), 2014-2025.